Built in the 1860s, The Corry House is located on Ogeechee Plantation in Union Point, Georgia. William Corry was deeded this land in 1798 and by 1840 it consisted of over 500 acres with an appraised value of $13,000. 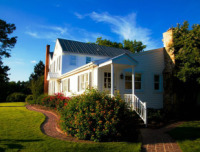 Originally a cotton plantation, The Corry House was built by E. Crawford Hixon in the 1860's. Hixon was a Confederate soldier who returned from the Civil War and built the home for his bride. Former Greene County Commissioner, Mr. Robert Corry, converted Ogeechee Plantation to a livestock farm with Hereford cattle. It served as a cattle farm until 1998 when the current residents, Doctors Bo and Ruby Cheves moved to Zambia. This family, the tenth generation family to live on the Corry land, began a tree farm that continues today. There is evidence of the old Southern history still present on the plantation. Remnants of old houses, a blacksmith shop, and cotton fields remain. The bell present in the front yard is the actual bell used to signify the end of the working day for the field hands. Take a few moments to explore the history and reminisce the days of old.